As America's Nutrition Leader, Zonya is a master of inspiration, motivation and visual humor, providing hard-facts information and simple solutions that help everyday people improve health, create balance and maximize energy. She is the only Registered Dietitian (RD) and Certified Health and Fitness Instructor (CHFI) in the country to have earned the prestigious Certified Speaking Professional (CSP) designation. If you're expecting a lecture-style presentation from this "energizer health bunny" - DON'T! Zonya pulls out all the stops in her live presentations and video seminars, delivering equal parts entertainment and education all the way. Zonya helps people laugh at their bad habits and discover the joy in adopting new, healthier habits. In fact, she has identified eight core healthy habits that create the acronym DIET FREE, originally published in her co-authored DIET FREE novel, Water with Lemon. In 2010, Zonya launched her complete DIET FREE video seminar lifestyle program for individuals and leader-facilitated programs. 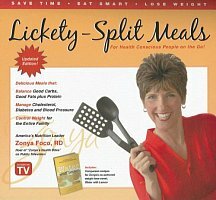 In addition to her professional speaking and writing career, Zonya is host of the television series, "Zonya's Health Bites," and a two-hour special, "DIET FREE with Zonya Foco, RD," on national public television. Since 2004, she has partnered with Health Alliance Plan (HAP) of Michigan since 2004 to develop and present its award-winning Weight Wise member programs based on her DIET FREE habits. Zonya has also worked with Bob Greene as a guest presenter for "Oprah & Bob's Best Life Challenge," providing entertaining and educational cooking presentations. In addition to spreading the word through speaking platform, books and TV show, Zonya has appeared on local newscasts across the country, nationally syndicated daytime talk shows and QVC. She has been published in the popular magazinesPrevention, Today's Dietitian, Total Health and Fast and Healthy Cooking. Addictive foods, bucket-sized portions, physical movement limited to keystrokes and remotes. It's hard to stay healthy in a culture that's anything but! Citing research, health trends and advertising power, Zonya explains how our culture is very much our enemy. Are we doomed or can we fight back? Conviction is key. From eating to exercise, Zonya delivers a compelling plan for embracing a healthy lifestyle "paradigm shift" with conviction over convenience. "Don't go on a diet, just change your lifestyle." While most people agree this is true, you must admit, it's much easier said than done! What exactly IS a healthy lifestyle? How can we ditch the diet mentality yet still be in control of our calorie intake? Can cumbersome number counting be replaced by a few simple habits we can rely on for the rest of our life? Come and learn Zonya's surprisingly simple yet powerful approach to gaining health and losing weight with the same 8 habits presented in her co-authored health novel, Water with Lemon. Whether your goal is to master your weight, cholesterol, blood sugar, energy or to simply have optimum health, Zonya promises that these eight habits will indeed change your life. You have a life. But maybe you have too much of a good thing. If you're too busy, too tired and too stressed, Zonya has surefire solutions that will bring balance to your life and a bounce to your step. When you're ready to get a grip, Zonya will show you how to start by simply letting go. So take a deep breath and get ready to laugh out loud as you learn the restorative power of saying the word 'no.' If, on the other hand, you have trouble saying 'yes' to exercise, Zonya will share her secrets for ways to make working out work for you. (Yes, you really can sneak exercise into your daily routine.) Stress is more than a state of mind; it's a person without a plan for actually living stress free. Now's the time to settle back as Zonya serves up stress-reducing strategies to simplify your life. Find out what ingredients a stress-free kitchen must-have; learn what foods can turn the tables on your stress level; and reclaim your right to live a healthy, vibrant life filled with energy and joy. Dismayed by the alarming health statistics related to poor nutrition in our kids today, Zonya knows it isn't always easy getting kids to eat healthy and exercise well. Her "Fit Families for Life" presentation is the perfect opportunity for parents and children to learn together the hard facts related to poor habits and discover how healthy habits can be a fun family affair. Leave it to Zonya's zany visuals and engaging style to transform the pickiest eaters into junior champions of good health and fitness as she introduces crazy, crafty, creative and successful ways to make good nutrition and exercise easy and fun for the entire family. What does it take to put your diet 100% on the winning side for fighting cancer? Is it five fruits and vegetables each day or does it take eleven? Will eating lean meats provide enough armor or do you have go completely vegetarian? What about organics; are they your only choice? Do you have to eat soy foods, fish and flax seed every day? If so, how tasty will your meals actually be? And will you really live longer, or will it just seem like it?! Join "America's Nutrition Leader" as Zonya walks you through a realistic and tasty approach for "fighting cancer with your fork" you can enjoy living with. Have you ever felt like you were in a dead-end relationship with your exercise routine? You joined the gym with glee but now never go. You set your alarm for an early walk only to hit the snooze. We know exercise is good for us. The benefits far exceed boosting metabolism and burning fat, to improving our immune system and helping fight heart disease, type 2 diabetes, cancer, dementia and depression. The secret to exercising; however, is to find what you love. Not just tolerate - but what you absolutely wouldn't dream of staying in bed to miss. Hard to fathom? Not after this session with Zonya! It's all a matter of matchmaking your unique personality with just the right exercise activity until you find your true soul mate - E Harmony! Zonya helps you "power date" all kinds of E choices you never knew enough about, like water aerobics, kick boxing, Jazzercise, tai chi, line dancing, arm-chair exercising, and Zumba. You'll learn about people who were just like you before they found "the one." True E Harmony! With your "E matches" in hand, you can date your way to finding your true exercise love. Soon you'll begin exercising like never before, and live happily ever after!